Hello! My name is Linda. I enjoy all types of photography and am likely to photograph anything and everything. I enjoy sharing my photographs. Prior to having access to the Internet, I shared printed photographs with family and friends in person and through the mail. I have dozens of photo albums full of photographs that I have taken over the years. The internet provides a wide audience by which to share my photographs. I created “The Beauty Around Us” website to showcase three types of photography: scenic photography, nature photography and portraiture. Provided above are links to four photo galleries: “America the Beautiful”, “Canada”, “Nature”, and “Beautiful People”. Each photo gallery is accessed by hovering your mouse on the pertinent menu item. The “America the Beautiful” photo gallery is organized by state. The “Canada” photo gallery is organized by provinces and territories. Within the “Nature” photo gallery, you will discover photo albums showcasing photographs of birds, butterflies, flowers and the sky. I love photographing people. Each and every person has a unique beauty and an interesting, very different way of expressing themselves. I love when I am able to capture a bit of a person’s personality, expressing in photography what I see in reality. The “Beautiful People” photo gallery is divided into two main photo albums — Portraiture and Weddings. “The Beauty Around Us” website also includes a photo journal blog that provides a glimpse into my life at home and on the road. It is the intent of my blog “Days to Remember” to capture a moment in time and place, preserving that moment through my photographs and words, so that I might share that particular slice of time with others. It is easy to subscribe to “The Beauty Around Us”. Just click on the Follow button at the bottom right side (or along the top) of the page and follow the instructions contained therein. My hope is that each of you enjoy the beauty around us! This photo of you and Bob is very clever and creative, also nice to see you two in the picture. It’s a lovely shot! Looks like your blog is off to a great start. I have already added it onto my other blog roll. This is wonderful Linda! Lovely images and layout… Have a happy weekend! You are such a talented photographer! Your pictures are just breath taking! I enjoy seeing all the beautiful snow since we live in FL and don’t see that too much around here. 🙂 I look forward to following your blog and enjoying more of your photography! 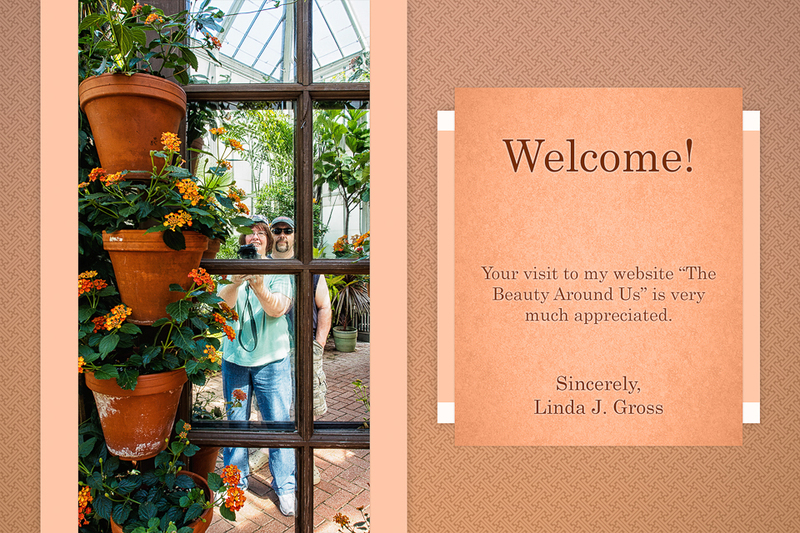 I love your photos… Thanks so much for stopping by my site and for following, I look forward to seeing more on your site. Hi; just looked at your big island trip photos, which i found randomly searching for the place of refuge tikis or ikis I guess. Wound up following your posts around the island which was similar to a trip I took there a few years back. I think you saw a lot and while I visited a few of the same places I also missed a few. No doubt you had the benefit of good tour guides you were visiting. I also think your photos were good. You have a good eye and your bird and flower photos were particularly nice and a good combination with the more typical travelogue series. I mean both were nice to see, but the big island is a challenge to photograph well don’t you think? So the detail and the colors of your closeup birds and flowers were nice to go with the wide open and somtimes somewhat empty spaces. Also, I remember well the distances you covered in your tour, so I also appreciate that you still took the time to find and compose your close up shots of the flowers and things the way you did. I think you really saw and captured the beauty and the expanse of the place. All very enjoyable and thanks for posting them and keep up the great photography! Thank you for taking the time to leave a comment to let me know you had looked at and enjoyed my Island of Hawaii photos. I hope to return one day. we love the nice try to your blog and your photography.